Wheatley Group embarked on a journey to discover their customer needs in relation to future housing. The focus was on people’s experiences and turning insights into action to develop future housing services. Snook was delighted to support this project. Wheatley Group provides homes and services to over 200,000 people in 17 local authority areas across Central Scotland. They’re committed to supporting people and helping communities to thrive. With an increasing population, diverse both geographically and demographically, planning for the future is crucial to prepare services for the changing needs of customers. Through a fast-paced 8-week research sprint, we set off to explore what current and future customers need from social housing, now and in the future. We worked with the Wheatley Group project team to research, design and prepare the interviews and workshops very carefully. The welfare of the participants was always at the forefront of everything we did. We made sure they would be fully supported before, during and after the workshop or the interview. Housing is at the heart of our lives and some sessions were quite emotional. Participants shared their stories and experiences with our researchers. They felt they had had a chance to tell their story from their point of view and without worrying about the impact on their circumstances. We were prepared to both look after participants and take care of ourselves during the project. The design of the sessions took research sensitivity in mind. Contextual interviews and workshops were structured around a friendly conversation allowing safe space for sharing insights. We used tactile tools, in this case – colourful building magnet blocks and little plastic people to help people tell their stories. These physical prototyping objects enabled us to focus on building what the future might look like. Our youngest participant was 13 and our most senior one was 85. We chatted with over 65 people in Glasgow, Renfrewshire and Edinburgh, visiting their homes and community spaces. We’d like to thank Scottish Refugee Council, Glasgow Housing Association, Castlemilk Youth Complex, Dunedin Canmore Housing Association and Glasgow Disability Alliance for hosting us and providing safe spaces for conversations to take place. During contextual interviews, participants offered unfiltered facts which helped us understand the physical, emotional, and social contexts of housing. We started building early user journeys. During workshops, insights enriched these journeys – adding depth and detail. From there, we started to identify patterns based on the customer groups. 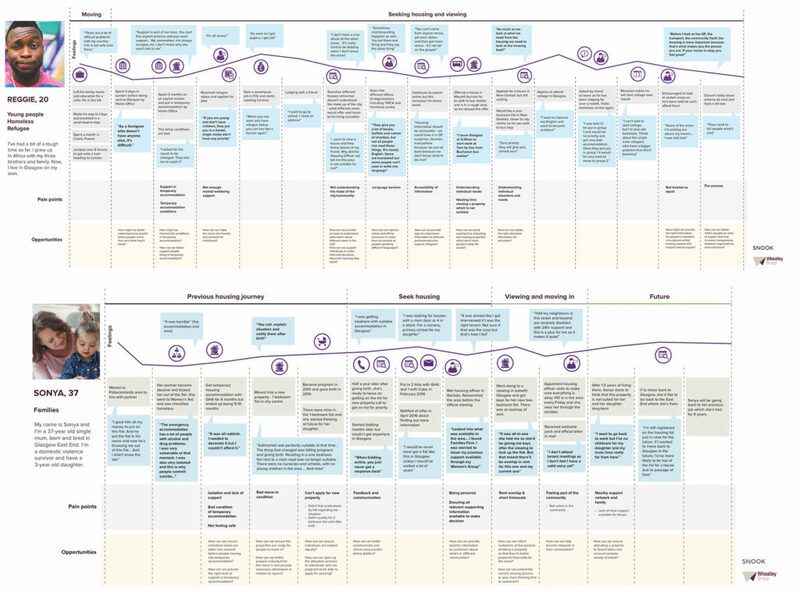 During the synthesis period, we created 6 full user journeys and 9 personas. In a long and detailed visual document, the journeys captured a person’s interactions with housing services over time, including their motivations, challenges and feelings. We always make sure that project outputs are not delivered just because they are outlined in the initial brief. We believe in providing deliverables which clients can actually use. We find that while personas are lively and easy to relate to, user journeys can be quite technical and not shared as widely as they could be within organisations. We wanted to break this barrier and explore ways to make user journeys more accessible. We suggested to bring one of these journeys to life through film and Wheatley Group played a key role as an innovator within the social housing sector. We started with Reggie’s story which represents the experiences of single male refugees frustrated with being homeless and the lack of representation. We hired an actor, developed a script, made a detailed storyboard – then, went out and about filming at different locations. It’s more than just a film – it’s a way of asking questions. Like any prototype, design or artefact, this short film is a way of asking questions. What would Reggie do if he had to use our service? How can we develop a better service for Reggie? Reggie’s story from Snook on Vimeo. During workshops and contextual interviews, we were truly humbled by the openness and willingness of people to share their stories. They told us how important it was for them to come along to sessions, share their experiences and feel listened to. They thanked us and hosting organisations for providing the space for this conversation to happen. Wheatley Group is using the user journeys internally when talking about their services and products, making sure customers are ‘in the room’ when these discussions happen even though not physically there. Some of the research findings were new to the organisation. For example, the workshop at Glasgow Disability Alliance revealed that mobility has over 10 different meanings across housing associations. Wheatley Group is now developing a working group for people with mobility problems to explore opportunities and solutions further. We also met people who wake up very early or stay up late to bid for properties as they were uncertain about what the process is and when to do this: “I don’t know if I apply at night time and other people apply at 8am… Does that make a difference?” (workshop participant at Glasgow Housing Association workshop). Wheatley group are exploring ways they communicate and design the process. “Snook provided new ideas and approaches and were challenging in a constructive way. Snook is a great company to work with - they not only delivered against our requirements but also provided added valuable insights which we are using to inform our products and services." Participatory design: who, why, how? User research: how do you look after yourself? User research: how to look after yourself and colleagues after difficult conversations come up? Want to re-design housing services?